This week there have been two significant developments for bighorn sheep in Idaho that relate to the closing of domestic sheep grazing in occupied bighorn habitat. First, in an unusual ruling from the bench, Judge B. Lynn Winmill ruled that the closing of three domestic sheep allotments on the Payette National Forest should proceed as planned because they are not subject to the language of the rider that Mike Simpson added to the 2012 Consolidated Appropriations Act that passed last December. In response to litigation by Western Watersheds Project and other groups, the Payette National Forest decided in 2010 to end domestic sheep grazing on 70% of the allotments open for sheep grazing. The reason for this was that domestic sheep carry deadly pneumonia that kills bighorn sheep. The bighorn sheep in Hell’s Canyon and the Salmon River Canyon have been suffering low recruitment of lambs from previous disease outbreaks for years and any new outbreak could end up eradicating these suffering populations. Because the domestic sheep industry was afraid of this precedent setting decision, Mike Simpson added language to the 2012 Consolidated Appropriations Act to keep this from happening anywhere else in the West and to maintain the destructive practice of grazing domestic sheep in occupied bighorn habitat. However, Harv Forsgren, the Region 4 Supervisor of the US Forest Service, overrode the recommendation of the Payette Forest and said that since the second of three phases to the Payette Decision, which closed three more allotments to sheep grazing, had not been implemented before July 1, 2011, they were unable to proceed. This brings us to the key discussion during Wednesday’s hearing in Boise that revolved around the word “existed” which the attorney for the USFS attempted to conflate with the word “implemented”. He argued that since the closing of the three allotments hadn’t been “implemented” yet that the rider forbid them from continuing. Since the Payette Decision had been finalized in 2010, and the permits had been modified and signed by the permittees by April, 2011, clearly the restrictions “existed” before the July 1, 2011 deadline contained in the rider. When all was said and done, the judge quickly decide to rule from the bench in favor of the plaintiffs who asked that the allotments be closed to domestic sheep grazing. This is a significant and long term victory for Idaho’s bighorn sheep. UPDATE June 15, 2012 Read the written Court PI order and Court Injunction. Clearly this contradicts what Simpson has said in the past. In a letter to a constituent, and on his own website, Simpson explained that the language of this rider would not affect the Payette Decision and was only intended to prevent the grazing plan on the Payette from being implemented elsewhere for one year. I have heard from a number of individuals who are concerned about this issue, and I believe it is important to clarify a few points. First, at this point the only place where grazing allotments have been closed is on the Payette National Forest. This language simply prevents the grazing plan on the Payette to be implemented elsewhere for one year. Under the language, the current status on the Payette meets the viability criteria for bighorn sheep. The other big development from this week is that the BLM has decided not to renew its Memorandum of Understanding (MOU) with the Agricultural Research Service’s (ARS) United States Sheep Experiment Station (USSES) which allowed the USSES to graze domestic sheep on the Bernice allotment near Howe, Idaho at the southern end of the Lemhi Range. New telemetry data from collared bighorn sheep made it clear that the risk of an interaction with domestic sheep was far greater than the USSES had portrayed in its Preliminary Environmental Impact Statement. The USSES uses several different parcels of land in eastern Idaho and southwest Montana. Some of the land in the Centennial Mountains and near Dubois, Idaho is owned by the ARS and is not open to the public, while other parcels are used under agreements with the USFS, BLM and the DOE. Because the location of the USSES sits right along a major wildlife corridor, it impacts all kinds of species like grizzly bears, wolves, wolverines, lynx, bighorn sheep, grayling, Yellowstone cutthroat trout, and others. The closing of the Bernice allotment is sure to put a kink in the Environmental Impact Statement process currently underway and will likely require the USSES to make significant changes to it or make an amendment to it. 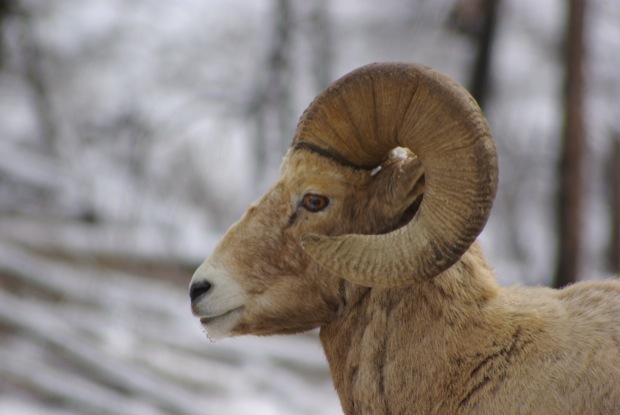 While closing the Bernice allotment is just one step towards eliminating the threat of disease outbreaks caused by contact between domestic sheep and bighorn sheep, it is a major step for the bighorn sheep in the Lemhi Range and may help to secure their long term existence. The closing of the Bernice allotment is good news. I have spent some time hiking in that end of the Lemhi Range and is potentially some of the best Bighorn wintering area I have seen. (I did see some Mountain Goats wintering on the steeper cliffs in that area) I think that historically, the Bighorns in the Lemhi and Big Lost River ranges migrated to the south ends of these mountain ranges to winter. The knowledge of those migration patterns has been lost by the remnant Bighorn populations and it might take some baiting with salt or apple pulp to get them to return to those ancestral wintering areas. A transplant of Bighorns to the Bernice allotment area might be a good move as well. I am very pleased with this too. The big cliffed canyons of Saddle Mountain were always a favorite of mine. Just north of the Bernice Allotment is Uncle Ike Creek where there was a bighorn restoration maybe 20 years ago. I stumbled onto them twice and got some photos. Do you know if any of them are left? I went back to the video of Dialogue on Idaho PTV and within the introduction Mike Simpson EXPLICITLY says that the rider was not intended to disrupt the Payette Decision. Gee, ya think he might have had second thoughts after that awesome cartoon hit the national news carnival? Good news certainly,my question is: Will these decisions have a “trickle down effect” regarding dom. sheep on the USSES’s Centennial Mtn. lands near Dubois closed to public. Sometimes known as the “high pature” or some such moniker? i.e. improving apex predators migration to and from the GYE into ID wilderness? This decision only affects the Bernice Allotment. However, Western Watersheds Project has been active in the EIS process and has advocated that the entire operation be shut down. This change will likely disrupt that process and, if the Bernice Allotment is as critical as they have maintained, then one would logically question their ability to function without it. I think they’ll now argue that the operation can continue despite the closing of the Bernice Allotment and that it wasn’t as critical as they previously maintained.